Please join us Wednesday 06.19.13 for another edition of Writing on the Air. We broadcast every Wednesday from 6-7 pm. You can catch us on your local Austin 91.7 FM KOOP radio station, or you can stream us LIVE on KOOP.org. You need to LIKE Writing on the Air on Facebook because … why not? Aren’t you on Facebook anyway? Our guests this week are award winning author Sherry Maysonave, and a special appearance by the owners of Tiny Toe Press, Michael Davidson & Bridget Gamber. AUSTIN, Texas – Today’s digital kids are glued to smartphones, iPads, PCs and gaming devices. 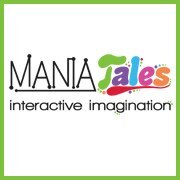 To more effectively leverage digital devices for educational entertainment, former educator, Sherry Maysonave uses interactive storytelling and lexical humor in her new ebook series, ManiaTales, to entertain while developing language skills and stimulating children’s imagination and creativity. Sherry and her husband and business partner, Stephen, launch the series with EggMania: Where’s the Egg in Exactly? (March 2013), an enhanced ebook aimed at children ages 6-12. Available now on the Apple iBookstore for the iPad, iPhone (3G or later) and iPod touch (2nd generation or later), EggMania is an interactive adventure of a boy who keeps hearing mispronunciations of the word “exactly” as “eggzactly,” even by highly-educated people. In his quest to find the “egg,” he searches the world and meets unusual creatures who help him discover the importance of speaking correctly while learning an important life lesson: even if he makes mistakes, he can still be extraordinary. The series is illustrated by Denise Caliva, renowned artist and owner of Caliva Arts. EggMania showcases a myriad of art styles, from classic to modern, expanding children’s art appreciation beyond the cartoons and gaming characterizations so often used in digital media. EggMania was produced by Austin-based eBook Architects, a Firebrand Technologies company. The next book in the ManiaTales series, EarMania: Where’s the Ear in Regardless?, will be released in the fall of 2013. Available: EggMania is available for only $9.99 on the Apple iBookstore. View the book’s video trailer at www.ManiaTales.com. SHERRY MAYSONAVE, an admitted grammar enthusiast, has a B.S. in Education and began her career teaching third and fifth grades. In 1998, she founded Empowerment Enterprises, one of America ‘s leading communication-image firms. A mother of three and grandmother of five, Sherry remains passionate about helping children develop positive self-esteem and achieve higher levels of success at school and in all facets of their lives. Sherry and Stephen live in Austin , TX . Please learn read more about Michael Davidson, Bridget Gamber, and Tiny Toe Press by visiting their website, TheOpenEnd.com. Thanks! See you on the radio!